Thanks for stopping by. We created this website to reach a wider audience. 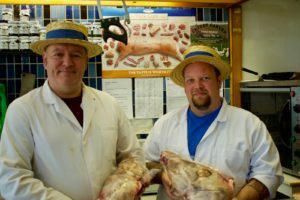 We love what we do: preparing and supplying top quality, locally sourced, meat and other goodies from our premises in Hyde Park Road Plymouth – and want to shout about it. It may be you live close by but don’t yet know about us. Perhaps you currently buy your meat from a supermarket so don’t see the need for a local butcher. Whatever, the reason, we want to use this little bit of the internet to tell you about us and our fantastic products. We’re not web gurus, techies or social media buffs. We’re not spring chickens either – though we can provide you with some of those! We’re butchers and we know our stuff. We’ve been in the trade for a good few years and take immense pride in what we do. Which is simply to bring great quality meat to you, so all you have to do is cook it and enjoy it, not worry about where it’s come from or whether it contains anything you wouldn’t be happy about. Talking about cooking, if you’re stuck for recipe ideas, we’ve got a few of those. All our recipes are cooked using ingredients we sell from our shop. And don’t worry if you don’t know your neck from your rump, our in-store wall charts will show you the way. Ask us about anything from different cuts of meat or ideas for what to prepare for friends coming to dinner, or simply what to give the kids for tea tonight. We hope you’ll find what you’re looking for on these pages, but if not, gives us a call or, even better, come and visit us. We’d love to see you.